The HP-50B heliport approach light is a white sequence flashing light used for approach guidance when the helicopter is landing. 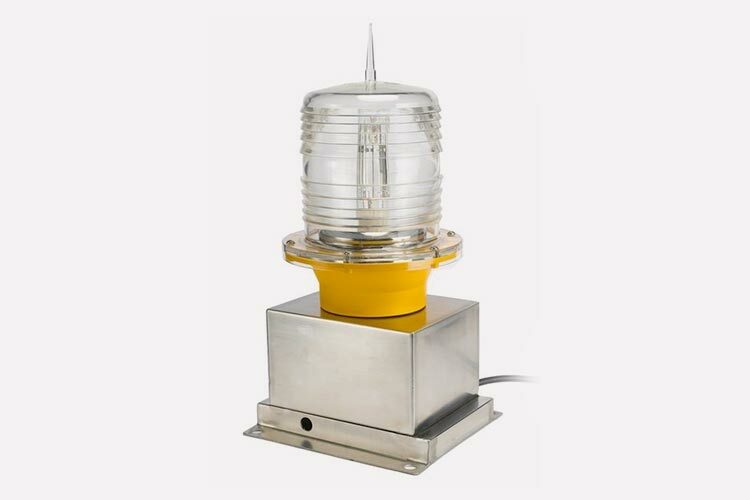 The HP-50B heliport approach light is a white sequence flashing light. Used for approach guidance when a helicopter is landing, it can provide instructions about an approach direction for the helicopter pilot. HP-50B can be installed in the exterior of the heliport perimeter lights for the direction of approach, unilateral or two-way installation. At least five lights are required per group. Flash is from the outside to the inside. The lamp cover adopts PC material of excellent impact resistance (IZOD notch impact strength: 90), thermal stability (service temperature can be 130℃), great transparency (available with a light transmission of up to 90%), auto-UV resistance, ageing resistance and flammability rating in UL94V0. The house of the light adopts stainless steel SUS304 and aluminium liquid casting and oxidation treatment. The product has key features that include a light weight, water tightness and seismic and corrosion resistance. There is also a frangible coupling in the bottom of the light. Light source adopts a cold light xenon tube, featuring high light (100Lm/W), light source life for flashing reaching 100,000,000 times. Widely used by the domestic and international aviation field. The light with surge protection device (In 7.5KA/5 times, Imax 15KA) can be used in harsh environments.